Early in Thursday afternoon's baseball game, it wasn't looking good for the Forbes Road Cardinals. McConnellsburg put up two runs in the second inning and led 4-1 more than halfway through the game. But the Cardinals exploded for four runs in the final three innings and captured a Sideling Hill/Inter-County Conference victory, 5-4. The Cardinals (2-1, 2-1 SHL/ICC) headed into the bottom of the seventh trailing 4-3. Brycen Hohman led off the inning with a single, and Matt Brown bunted for a hit to put a pair on base. Weylin Mitchell also bunted for a hit, and Hohman scored on a throwing error. Grayson Hall then walked to load the bases, and Lane Kendall hit a sacrifice fly to score the winning run. McConnellsburg (1-1, 1-1 SHL/ICC) had only one error, but it proved quite costly. Landon Richards and Quintin Miller each had a pair of hits for the Spartans, while Hohman and Hall had two singles apiece for the Cardinals. Chambersburg’s Leah Hunt came up in a dangerous situation in Thursday’s Mid Penn Commonwealth Division softball game. Dangerous for Mifflin County, that is. Hunt, who already put the Trojans on the board with a two-run double in the top of the first inning, whacked a three-run home run to left field in the top of the eighth inning to lift her team to a 5-2 victory. Hunt also picked up the win on the mound by pitching the final four shutout innings. Tara Harmon was 3-for-4 and Laken Myers had two hits for the Trojans (2-0, 2-0 MPC). 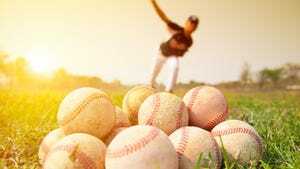 Chestnut Ridge 5, Southern Fulton 4: Southern Fulton ran into a strong pitcher in Chestnut Ridge’s Phillip Dull, and it resulted in a Sideling Hill League loss for the Indians. Although SF (2-1, 2-1 SHL) managed seven hits, it was struck out a season-high 10 times, including seven by Dull. Zach Clark led SF with two hits, while Coope Grove drove in a pair of runs. Mercersburg Academy JVs 8, Cumb. Valley Christian 7: The Blue Storm led 8-0 until a late rally by the Blazers (0-1). Devon Landis was 2-for-4 with a triple for CVC. Grace Academy 11, Shalom Christian 1: Shalom Christian suffered a five-inning defeat at the hands of Grace in a Mason-Dixon Christian Conference game. Brady Beckner had the only two hits for the Flames (0-2, 0-2 MDCC) and scored their only runs. McConnellsburg 5, Forbes Road 3: McConnellsburg did just enough to ensure a Sideling Hill/Inter-County Conference victory over Forbes Road. The Spartans (2-2, 1-1 SHL/ICC) were led by Madison Koontz and Justice Seville, who each had a pair of singles. Despite taking the loss for Forbes (1-2, 1-2 SHL/ICC), Courtney Schoen fanned eight batters. Fannett-Metal 5, Juniata 2: Now on a three-game win streak, Fannett-Metal picked up a non-league victory over Juniata. The Tigers (3-1) got a complete game from Brooke Harris, who struck out six, and had a two-double performance from Morgan Ritchey, who plated a pair of runs. McConnellsburg sweeps tri-meet: McConnellsburg got off a great start with a sweep for both the boys and girls team. The boys (2-0, 1-0 Inter-County Conference) beat Mercersburg, 83-67, and Juniata Valley, 111-34, while the Lady Spartans (2-0, 1-0 ICC) defeated the Blue Storm, 82-63, and picked up a narrow 80-70 win over the Hornets. Mercersburg’s boys (1-1) beat Juniata Valley, 100-39, while the girls (0-2) lost, 77-70. McConnellsburg’s McKenzie Gelvin had the highlight of the day, picking up overall wins in the 400 (59.7), the 200 (27.1) and the long jump (14-9.5). Central Dauphin 17, Chambersburg 2: Brandin Cosey and Thomas Elie scored the goals for the Trojans (0-2, 0-1 MPC). In goal, Clayton Schellhase made 10 saves and Jared Seacrest 3 had. The Rams led in shots (42-9) and face-offs (15-5). St. James 12, Mercersburg 8. Central Dauphin 16, Chambersburg 3: Kendyl Stewart, Hannah Raines and Liza Ernst scored goals for the Trojans (0-2, 0-1 MPC). Ernst (6) and Rachel Dusman (5) led in ground balls. 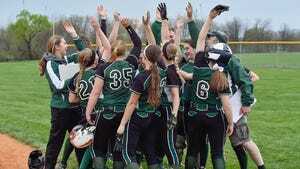 James Buchanan 5, Susquehanna Twp. 0: Jalen Ayers and Noah Shank completed a hard-fought win at No. 2 doubles to complete a non-league sweep of Susquehanna Township. The duo won 7-5, 3-6, 6-4, and JB is now 7-0 on the season. Shalom Christian 6, Grace Academy 0: Lexy Poe scored a hat trick for the second straight game and the Flames (1-1, 1-1 MDCC) also 2 goals from Brooke Emge and one from Lydia Harris.